How Many Staircase Spindles do I need? As a general rule, please allow two spindles per tread, and then deduct two spindles for the top and bottom newel posts to determine the total number of spindles required for your staircase. For the landing, measure the length of rail between posts (in millimetres) and divide the total by 112. Please note, this formula works for 32mm and 41mm sized spindles. Which Spindles do I need for my landing? 900mm length spindles can be used on both the staircase and landing areas. How far do I need to space my spindles apart? 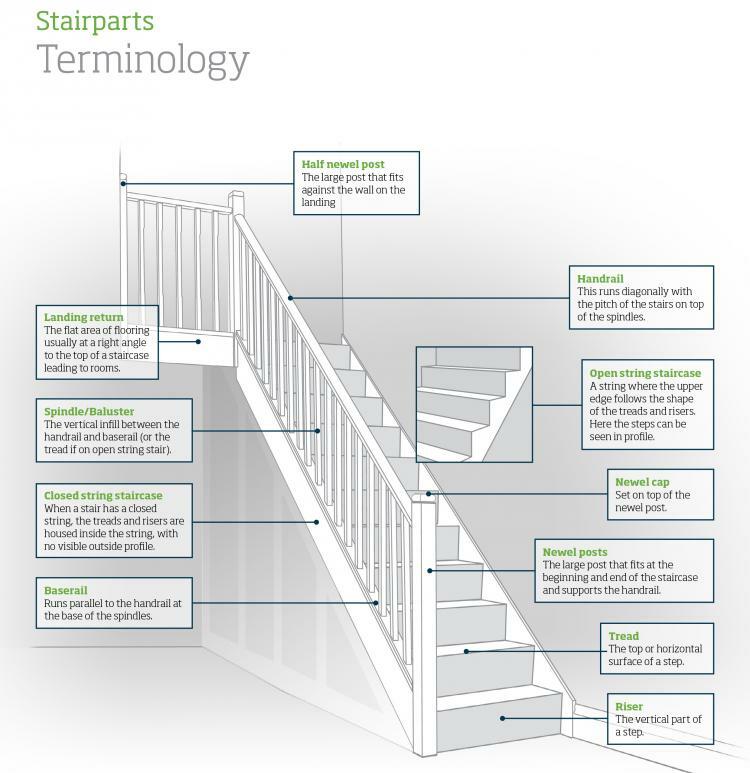 Building regulations state that a sphere of 100mm diameter must not be able to pass between two spindles on a staircase or landing area. How do I find the right angle to cut my staircase spindles and handrail? A Sliding Bevel is the simplest way to find the pitch of your stairs. This can be transferred to your spindles and handrail to ensure you cut at the right angle. TOP TIP – Cut one spindle and insert it in the grooves between the hand and base rail. Slide the spindle up and down the entire length of the rail to highlight any differences in height along the full length of the rail. Never cut all your spindles in one go. Cut three or four and fit them before moving on to your next batch. If your handrail is slightly “out”, then the distance between the Hand and Base Rail may get larger or smaller as you move up the stairs. By cutting just a few at a time, this will allow you to adjust your spindle length as you go. How do I fix my Spindles in place? Hand and Base rails come with fillet strips that help to sandwich the spindles into place. Bed your spindles and fillet strips on PVA wood glue and pin the fillet strips with 20mm Panel Pins. This will ensure your spindles are strong and secure. TOP TIP – Use the panel pins at an angle through the spindle and into the base rail below the level of the fillet strip. Do this before fixing the fillet strip in place. This will stop spindles from rattling. TOP TIP – Countersink the panel pins into the filet strip and fill with wood filler before finishing. How high does my handrail need to be? Building regulations state that the height of a staircase handrail must be 900mm from the front of the step to the top of the handrail. The handrail height for a horizontal landing area must be 900mm from the finished floor to the top of the handrail. On a balcony, handrail height may need to be increased to 1100mm, but please check with a building inspector before installation. How do I fit a handrail to a newel post? A traditional mortice and tenon joint is the strongest way to fix handrails to newel posts, but you can also use a Universal Handrail to newel post fixing kit for a quick and simple assembly. Please check out our blog for more information and in-depth instructions. How do I fit my newel posts onto my stairs? For a new build, or a total newel replacement on your staircase, the newel will need to be fitted by housing the post or newel base over the stair string (the side of the stairs) and around the bottom step. When fitting new and replacement posts on the landing area, you will need to take up the floorboards and lap joint the posts or newel bases to the floor joists. Half Posts are cut to floor level and screwed to the wall. For refurbishment posts with a spigot dowel, you will need to cut your existing newel post off square and drill a 50mm diameter hole in the top. The spigot newel post is then glued into position ensuring you can achieve a handrail height of 900mm. TOP TIP – When fitting spigot type posts, drill through the newel base and spigot dowel and insert a tapered dowel - one through the front face and one through the side. Cut the dowels, sand and finish. This will strengthen the joint between the newel post and newel base and stop and any potential wobble. If you need any help or advice, please call our technical helpline on 01691 671020. 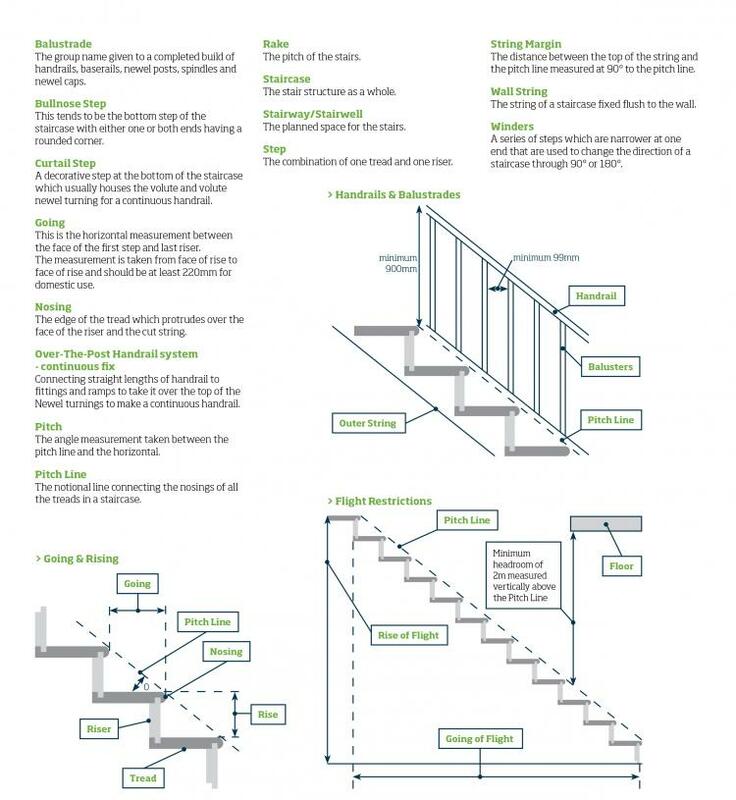 Alternatively, try our easy to use stair balustrade online planning tool.